Last Saturday, I had the pleasure of sharing my art-making process at The Gallery at the Arboretum Library, (Los Angeles County Arboretum and Botanical Garden). I started at 11:00 in the morning by setting up my computer station. 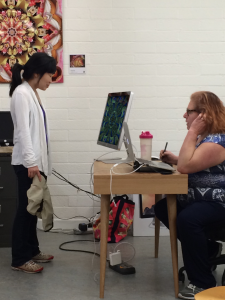 I am using a MacBook Pro with an external monitor. This enables me to mirror my screen and be able to talk face-to-face with people; they can see what I am doing without standing behind me. Pumped-up Peacock with components. Click the image to see enlargement. Once I decided on the image, I began creating layers of kaleidoscopic reflections. The program I use for this is ArtMatic Designer. It gives me some very powerful tools to change the shape of the mirrors. In a normal session, I will render out at least a dozen layers to select from. 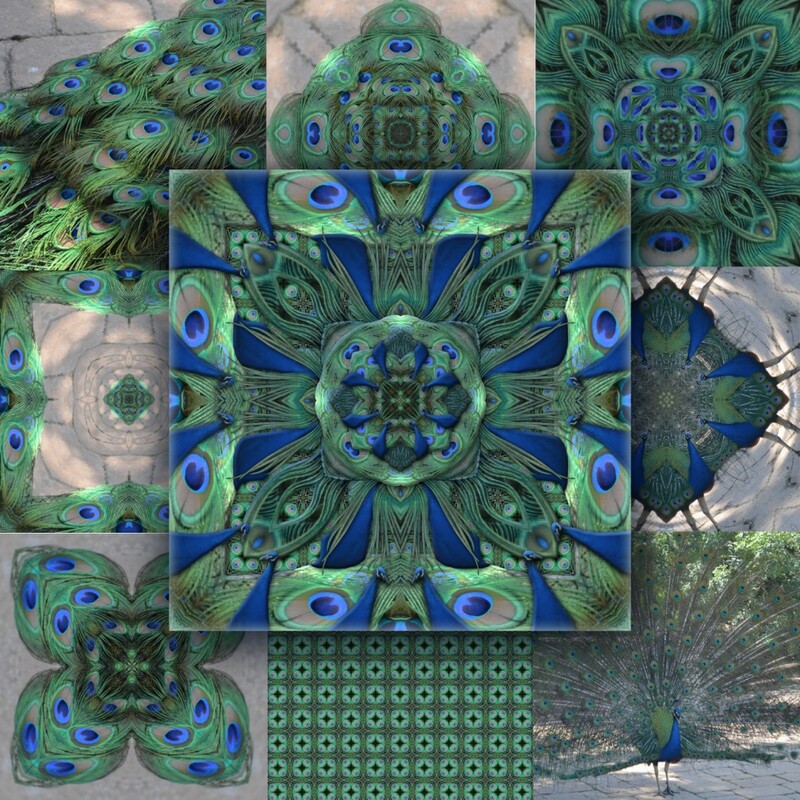 Click on the image of Pumped-Up Peacock for an enlarged version to see the layers and base images that were used to make the artwork. For the remainder of the work I use Photoshop. The layers are cut apart, stacked and shaded until I decide the piece is done. This is the first time that I have created an entire artwork outside of my studio at home. I wasn’t sure I could do it considering the time constraints. I did it! I was able to finish the piece in five hours. April 16, from 11:00 am – 4:30 pm. The gallery show continues through June 30, 2016. Check the Arboretum website for hours.